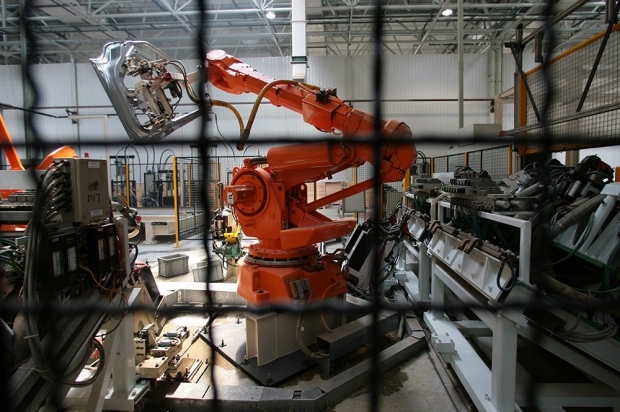 A welding robot operates on a production line for MG cars at a plant in Nanjing in 2007. By Caixin staff reporters Li Xuena, Wang Xinci, and Zhang Boling. This article was first published in Caixin. Every day, two quality-control supervisors monitor four robots tirelessly assembling remote-control devices for home appliances at a Midea Group factory in Foshan, in the southern province of Guangdong. The robots recently replaced 14 workers on the plant's assembly line for remote controls. And soon, according to Midea's Home Air Conditioner Division Deputy General Manager Wu Shoubao, more robots will arrive to replace the quality-control supervisors. Midea, a major appliance maker, is in the forefront of a full-blown charge by China's manufacturing sector into robot-powered factory automation. Companies nationwide over the past five years have ramped up robotics in the face of labor woes, such as worker shortages and rising wages, and to cut their production costs. In the process, they've helped build a new market for Chinese robot manufacturers that are competing against multinational rivals. Labor shortages are partly linked to what Wu says are changing attitudes among young workers. Young adults historically formed the backbone of the country's assembly-line workforce, but he said many born between 1990 and 1999 now shun manufacturing jobs for other pursuits. The working-age population—defined as those between ages 16 and 59—is slowly declining. The National Bureau of Statistics said this age group's population fell by 371,000 in 2013 to about 915 million last year. Moreover, companies looking for inexpensive labor in Asia are no longer focusing on basing plants in China alone, as labor costs in many other countries are far lower. The International Labor Organization says an average worker's monthly wage is the equivalent of 911 yuan in Vietnam and 603 yuan in Cambodia, for example, but 3,483 yuan in China. Midea's automation push got under way in 2011, just as Guangdong-area manufacturers were starting to grapple with labor dilemmas including worker shortages and high turnover. The company imposed a hiring freeze and then implemented a policy requiring that divisions with high turnover install automated systems. The transformation is continuing today at Midea. Its residential air conditioner division, for example, plans to cut 6,000 of its 30,000 workers by the end of 2015, and another 4,000 by 2018. Midea invested 800 million yuan between 2011 and last year to install automated systems with some 800 robots. It plans to spend up to 900 million yuan to add another 600 robots this year. Not only are robots helping Midea resolve labor issues, Wu said, but they're also improving production and product quality. The International Federation of Robotics (IFR), which represents robot manufacturers and research institutes, said China last year surpassed Japan to become the world's biggest market for industrial robots. Some 200,000 were operating in China at the end of 2014, the IFR said, with 32,000 installed in 2013 alone, accounting for 20 percent of worldwide installations that year. The robot-to-worker ratio in the country is still relatively low, the IFR said, with 30 robots working in manufacturing plants per 10,000 employees. Japan's ratio is 11 times higher. Four multinational companies—Switzerland's ABB Group, Japan's Fanuc Corp. and Yaskawa Electric Corp., and Germany's Kuka Robot Group —are the dominant suppliers of robotic systems for factories in China. Mir Industry, a Chinese industrial consultancy, said the four account for about 58 percent of the nationwide market. Zhang Hui, General Manager of the ABB Small Parts Assembly Center in China, which services robot clients, said his company spent years focusing on the world's developed countries, but now works to win clients in emerging markets with total-solution packages. "In emerging markets such as China, we provide our clients with more solutions than products," Zhang said. Meanwhile, domestic robot makers are vying for a bigger piece of the action. One up-and-coming company is Foshan Xinpeng Robotics Technology Co. Ltd., most of whose clients are bathroom tile and ceramics manufacturers. Qin Lei, who founded Xinpeng with 60 workers in 2013, said his company's robots perform ceramic-glazing tasks that pose a health hazard to human workers. Xinpeng reported 30 million yuan in revenues last year on sales of some 100 robots. Domestic robot manufacturers and systems integrators advertise themselves as better than multinationals for the China market in part because of their expertise in assembly line processes, particularly for computer, telecommunication, and consumer electronics manufacturing, said Deng Qiuwei, General Manager at Shenzhen-based Rapoo Robotics Applications Co. Ltd.
Deng said his company built a robot system for a client's remote-control device assembly line with the goal of integrating the entire process, not just for replacing workers. "We actually used the robots as a platform for realigning the production line," he said. Manufacturers have benefited from growing competition between Chinese and multinational robot companies. Qin said Chinese robot-makers since around 2010 have been offering budget-priced machines that forced global manufacturers to drastically cut prices. ABB, for example, last year slashed the price of a robot model similar to one made by Xinpeng to 200,000 yuan from 500,000 yuan, he said. A private equity manager who asked not to be identified said he decided to invest in robot manufacturers after touring recently automated electronics plants in the eastern province of Jiangsu and Zhejiang. He found robots there were being used not only for dangerous jobs and simple tasks, but also to handle complicated chores that otherwise require workers with special skills. "At first, robots replaced workers who had jobs that exposed them to pollution, such as painting, or required that they repeat the same task," the equity manager said. "But gradually, robots have been used for trades requiring skilled workers, such as welders, because they are cost-effective." Yet some companies have automated their factories simply because they cannot find enough people. A mid-level manager at an electronic manufacturer said that many businesses that are unable to fill positions have had no choice but to install robots. "Workers quit every day," he said. "Physically challenging jobs under harsh conditions or jobs requiring repetitive processes are much less attractive to young workers than the older generation." Zhang Fan, who oversees automation at a Midea factory in Wuhu, in the eastern province of Anhui, said the plant installed one robot in 2011 and another in 2012 to rapidly move 70 kilogram air conditioners on an assembly line—a job that was too strenuous for people. The electronics manufacturer Foxconn Technology Group has been among the most aggressive promoters of automation in the country. Playing into the push to replace workers with robots were accusations that its factories abused workers, reportedly leading to suicides. But the company failed to meet a 2011 goal set by founder Terry Guo, who predicted that by 2014 Foxconn would install 1 million robots at its plants in China. Foxconn's Automation and Robotics Division chief, Dai Jiapeng, said that so far these installations have amounted to only several hundred thousand sets of automation equipment. In other words, Dai said, just over 10,000 robots have been installed on Foxconn assembly lines. He also said automation rates at Foxconn plants vary from 40 to 70 percent. Guo's goal was apparently too ambitious. For example, Dai said, the company found automation ineffective for assembly lines on which people work better than robots. One Foxconn engineer who preferred not to be named said most Apple Inc. electronic products are still assembled by people because mechanical devices can scratch the products' alloy cases, but fingers do not. ABB's Zhang said he's recommending Chinese manufacturers look carefully at robots, but take care not to automate their factories more than necessary. Robots are best suited for overcoming labor issues and cutting costs. Ultimately, he said, a unit should improve productivity. In some cases, hiking wages is more cost-effective than replacing workers with robots, Zhang said. Indeed, he said, ABB's business in China has been slower than previously expected because many companies have found robots are still more expensive than laborers. It's a different story in Japan, where years ago a shift to robotic manufacturing started with companies seeking to escape high labor costs. Rapoo's Deng noted labor costs in Japan are five times China's. A Japanese company "could afford to use two robots to replace one worker," Deng said. "But in China, it's only worth considering when one robot can replace three workers." That said, a lot of Chinese companies including Midea have already decided to push ahead with automation and grow their robot populations. "If it's a task that a robot can do, we'll have one do it," said Wu Shoubao, Deputy General Manager of Midea's Home Air Conditioner Division. "That's our strategy."